WikkaWiki 1.1.6.4 introduces a new system page, AdminPages, accessible by system administrators to facilitate various page management tasks. This code has been extensively beta-tested in previous versions, and has been enhanced for 1.1.6.4 to include mass reversion of page contents to previous versions. In the event of a malicious attack that creates or edits multiple pages, the page administration module allows administrators to revert either single page or multiple pages to the previous version. Pages are reverted only to version immediately preceding the page to be reverted. It would be useful to revert back to either a specific page version or a date. 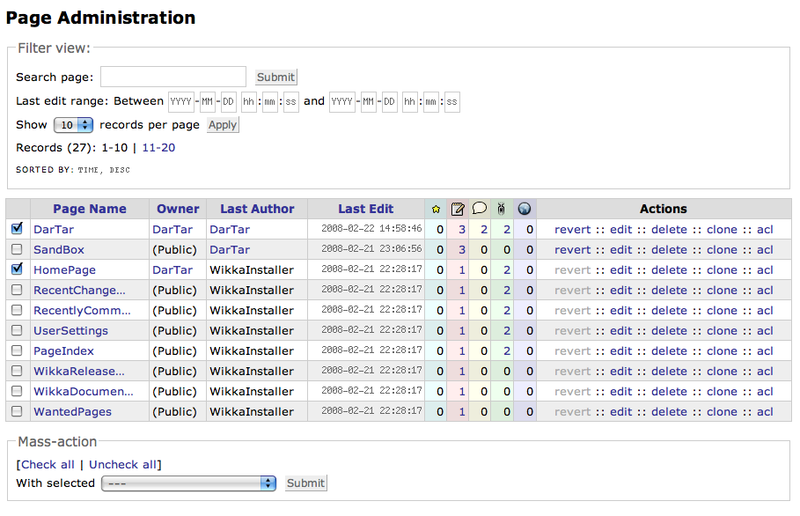 The current Page Administration module is a work in progress. While operational, several features remain to be implemented. Suggestions for improvement are always welcome.